Purchase a hardcover journal to use as your Writer's Notebook throughout this course. Take the time to decorate it in a way that is meaningful to you. Upload a photo of it and summarize why you chose to decorate it as you did. As my writer's notebook developed while I was attending the Writing Institute at Columbia University, it reflects my experience there. The front is a large photograph of me at the entrance to Teachers College. This is proof it wasn't all a dream! 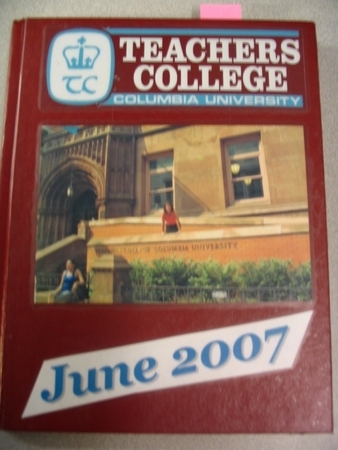 A Teachers College logo and the date of the institute complete the front. The back has more logos from Columbia. However, it also has a photograph I took of the Statue of Liberty while on a boat tour symbolizing the fun I had as well as the awesome places I was able to visit. A postcard from a viewpoint of looking straight up at a skyscraper depicted my feelings of being in a city surrounded by tall, tall, tall buildings. I had never experienced not being able to see the skyline for so many days in a row. In the lower right corner (and it should have been in the lower left as it was not very "right") is a small slice of a postcard from the hotel where I stayed. The size of that memento is revealing in itself. 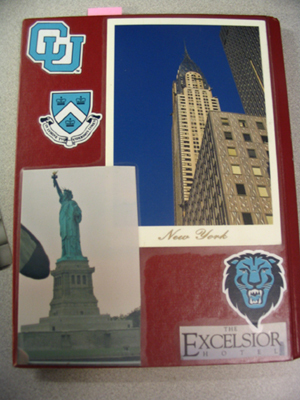 I will always remember my time there when I look at my notebook.